When Barkley reduced their office footprint from occupying all four floors of their building to just the top three, they needed to revamp their entire building experience. We started with the entryway by creating a custom sculpture to signal you have arrived, branded signage that clarifies our new layout, and a built-from-scratch reception area on the second floor. 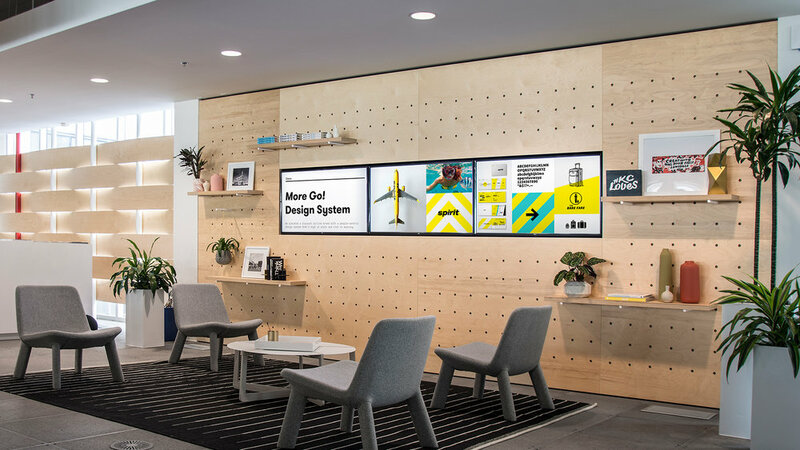 The reception area, aka the Barkley “Bus Stop” utilizes three consecutive screens in a custom cabinet to satisfy a variety of needs including: on-demand client introductions, local time and weather, work highlights to keep employees and visitors up-to-date, and drone footage of our neighborhood to provide a breath of fresh air. 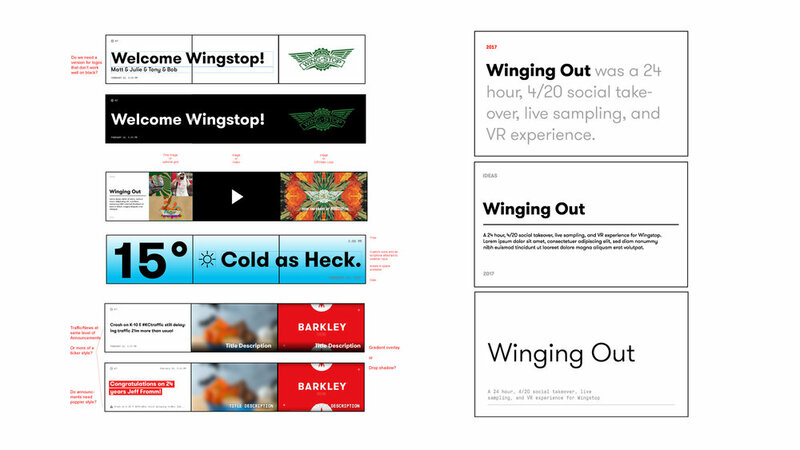 Along with real-time contextual data, the system is templatized for effortless updating of client logos and fresh case studies. In addition to an animated greeting, Welcome mode includes a salutation that changes based on the time of day. Today mode features up-to-the-minute animated weather icons and has a spot for customized messaging. Ideas mode is great for showcasing components of a project individually or supersized across two screens. Each mode displays at a specified frequency between smooth transitions all day long. The wayfinding experience needed some love too, as evidenced by many years of everyone forgetting where to find “Uranus” . We solved that by creating a streamlined naming and signage system that works for newbies and veterans alike. 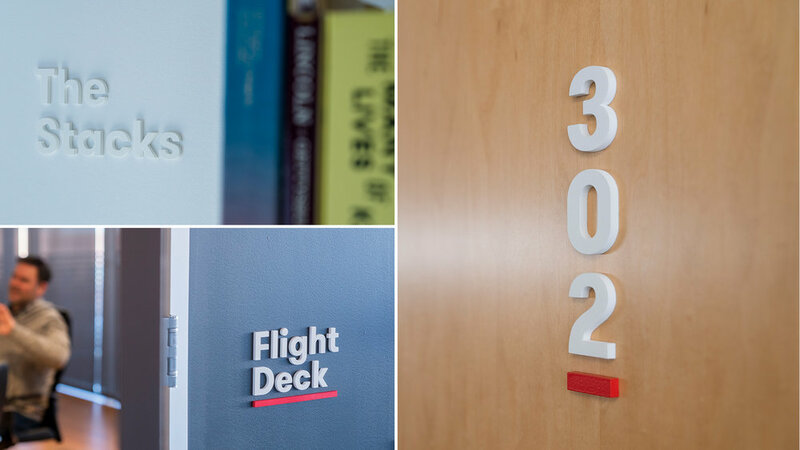 Now every floor is anchored with directional signage at elevator landings, landmarks are formally named to create memorable spaces and codify our internal language, minimal signage is located in the thoroughfares to keep people going in the right direction, and an intuitive numbering system has replaced all but a few meeting room names. 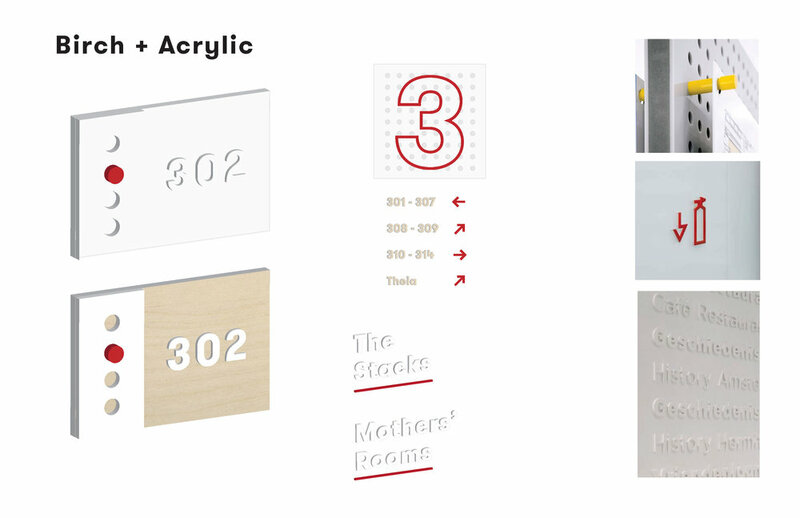 All signage was fabricated in-house after prototyping a variety of form factors.